Second house in row of six, probably mid C19, remodelled c1913 by J Coates Carter for Dom Aelred Carlyle. Two more cottages at the W, with lower roofs, seen in early photographs, were demolished after the others had been remodelled. Peter Anson shows the original window paintwork as green. Cobbled path in front and walled strip gardens the other side with rubble stone low walls, formerly whitewashed. Old photographs show 2 pairs of circular chimneys on outshuts to rear of Nos 1-4, and the small windows on the facade of Nos 5-6 not present. Restored 1998 with concrete imitation clay tiles and fascia boards instead of gutter brackets. Second house of row of cottages, whitewashed roughcast with late C20 clay-tile roofs and 5 chimneys, 2 larger. Two storeys, four two-window cottages (Nos 1-4) and 2 double-fronted cottages to E (Nos 5 and 6). Renewed 12-pane sashes and C20 doors. Nos 1 to 4 are 2 mirrored pairs with doors in inner bay. Outshut rear to Nos 1-4 with 4 lead-clad dormers with casement pairs. Rear garden wall in whitewashed rubble stone with 5 arched doors, the arch-heads of last 2 higher than the wall-head, all with stone voussoirs. Sixth has lost the arch. Wall-head raised in blockwork to support a plastic sheet roof. 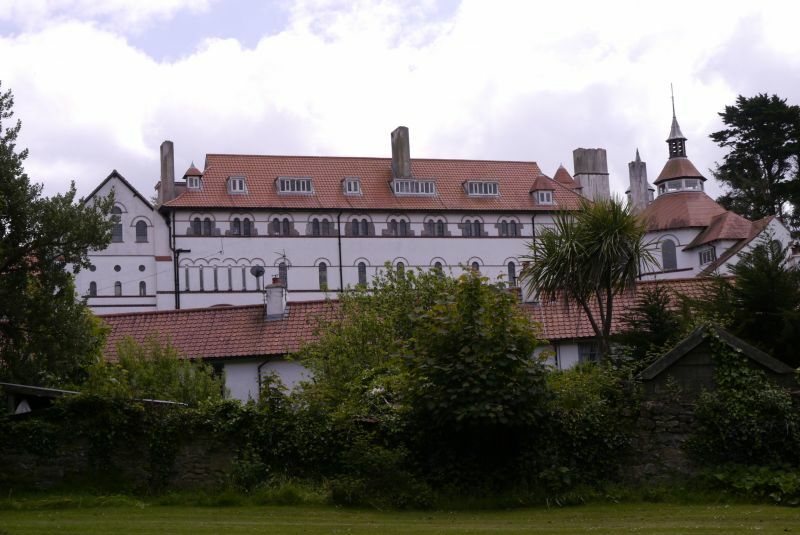 Included as part of a cottage row prominently sited on the "village green" of Caldey Island in shadow of Abbey. Situated at NW angle of abbey buildings, on crag above the Post Office.